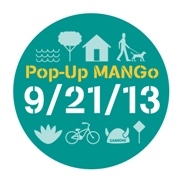 POP-UP MANGo, Temporary Greenway Installation and Community Festival! Don’t miss this FREE, fun-filled, family-friendly festival and community conversation about the Michigan Avenue Neighborhood Greenway (MANGo). Pop-Up MANGo invites the community to take part in the planning of this potential new Greenway in the Pico Neighborhood. Mark your calendars for this second interactive planning workshop! We join the City of Santa Monica for a fun, family-friendly event that will provide community members with a interactive understanding of the project and its many elements. You won’t want to miss this exciting opportunity to take part in the planning of this beautiful new Greenway. The Michigan Avenue Neighborhood Greenway is intended to create an inviting streetscape along Michigan Avenue and adjoining streets. The potential, three-mile Michigan Avenue Neighborhood Greenway (MANGo) would connect residents to schools and community destinations via an inviting streetscape of sidewalks, calm roadways, increased trees and landscape. Spanning from Stewart Street to the beach, the Greenway would provide residents and visitors with a safe and comfortable place to walk, bike, interact with neighbors, and just be. The project will make it easier to get around Santa Monica without a car, enhance the livability of the neighborhood, and improve environmental quality. Held along the central portion of the Greenway on Michigan Avenue, this unique family-friendly workshop will present a number of temporary installations that are representative of possible measures for the three-mile corridor. Examples of the temporary installations that participants should expect to see came out of input and ideas gathered from the community and include curb extensions, enhanced landscaping, places for impromptu neighborhood interactions, wayfinding signage and traffic calming measures. Community members will be encouraged to visit each installation by foot or by bike. Santa Monica Spoke will lead two bike rides during the event that will start at the festival and preview the entire route of the proposed greenway project. Participants will be asked to provide their feedback and project team members will be available to answer questions. Food trucks, music, art, and interactive activities will be a part of this exciting day. Additional information will be posted as it is confirmed. Participants are encouraged to walk or bike to the event. Planning and outreach for the Michigan Avenue Neighborhood Greenway is funded by a Caltrans Environmental Justice Grant. PLACE: Virginia Ave. Park / LUGAR: Parque Virigina Ave.
We are excited to hear a presentation on the project, and help collect input from the residents and the community. carefully, where sidewalks are comfortable and inviting, where bike riders can travel safely, where neighbors can socialize and interact. Your voice can help make this happen! After the presentation there will be walking and bike audit tours on Michigan Ave to help get ideas. You can choose to join the walking tour or bring your bike if you would like to join us on the bike tour.